A 3.59 MB download for 8-12 players. A medium sized map which sadly has nothing to do with H. P. Lovecraft's works at all. There is one "blackmagic" pentagon tex imported, and one "mad scientist" one, but that's it then. Gothic castle looks, a couple of monk statues, two lava basins. All arranged as two parallel rows of rooms with cross interconnections. Not a single ambient sound. Nice music, though. Architecture is quite simplistic. Cubes mainly, cylinders here and there. A ludicrously steep curved staircase, bad bsp cuts on the "bowl" of lava over the pentagon; that's about it then. Lighting looked quite bad. An ugly bright purple at times; in the lava rooms you have way overdone dynamic effects. But at least the author tried to make it all appear sourced by putting flames and lanterns here and there. Bots aren't overly clever on this map. They never went for: shieldbelt, keg, redeemer. Had major difficulties getting the launcher. Hardly ever tried to ascend the curved stairs, and if they tried, they fell down into the lava and croaked... They don't camp or snipe or translocate, or hammer-jump. Flow was acceptable, though faaar from perfect. Some parts are very tight, like around that staircase. Some playerstarts see you spawning to a wall. The teleporters to the redeemer are not properly directed and thus really hurt the flow. Theme overall was dead average. At least it stayed halfway consistent. Playability is good, which is mainly due to the low polycount. 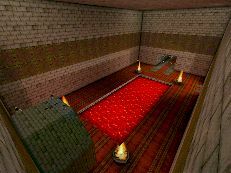 However, the overdone dynamic light effects, especially in the lava room with the staircase, pointlessly bring it down some. Item placement was another thing I liked. While Amp and Invisibility lay deadbang in the middle of the floor and one just has to walk over it, the rest was put at nice places. No overkill of ammo or health. Two nicely hidden teleporters taking you to the redeemer. A map which suffers from many issues sufficient beta-testing might have been able to fix. The bots were the only thing that might have been able to save the Fun score, but as I wrote above: they just weren't good enough. Yep, I'm still bad at texturing and bot pathing, BUT the bot's DO get the redeemer. If you just wait long enough in the room where it is you will see :) Un-animated lava? How can you make it "animated"? And as far as ambient sound's go, I just found out that you can give the fire a "fire" sound.....I'm an idiot :( Thanx for the review Rabid, it's what I expected. you should spend some time over at planetunreal forums in the editing section; it will answer many of those questions like how to make it animated and placing ambient sounds and stuff. I would have gave it a 2 .But now I give it a zero for a misleading title. The map is very cubic, and the textures arent great too. the item placement was ok but sometimes weapon were too far away from each other. Bots play ok, but i didnt see them get the belt, i did see them taking all the other pickups.